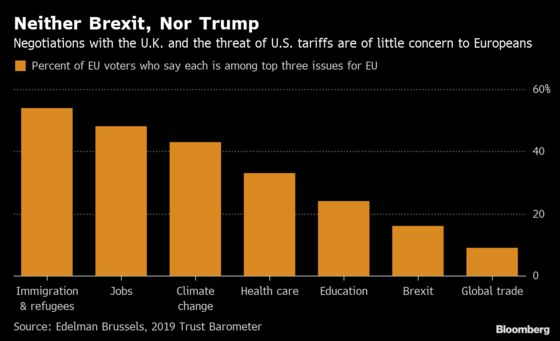 (Bloomberg) -- Neither the stalled negotiations for the U.K.’s withdrawal from the European Union, nor the threat of tariffs and trade protectionism top the list of concerns for European voters, according to a survey by marketing firm Edelman Brussels. Populist parties hope to capitalize on persistent fears about immigration, as they seek to dislodge Europe’s two biggest political groups in the elections for the EU Parliament in May. Climate change also makes it to the top three of the list, as ever more frequent extreme weather has alarmed Europeans.